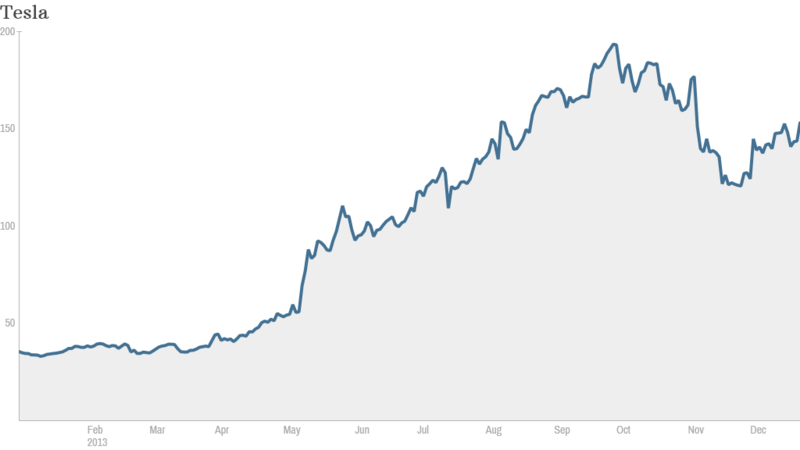 Click the chart to track Tesla's stock price. Shares in Tesla spiked more than 5% Tuesday. Why? Because the company said federal officials have reaffirmed the five-star safety rating of the 2014 Model S.
But the news from the National Highway Traffic Safety Administration appears unrelated to the federal probe into Model S fires -- a safety issue that has dinged Tesla stock in recent months. In fact, Tesla (TSLA) also said that it is still "awaiting feedback from NHTSA regarding their investigation of recent fire incidents." Tesla remains one of the hottest stocks of the year, up more than 350%, but it had lost momentum during the past few months due to a series battery fires. Even though Tesla CEO Elon Musk reassured investors that there was "no reason for a recall," the stock tumbled more than 40% through October and November. The stock has gained some ground in December, but is still 20% below it all-time highs. In November, federal investigators started a probe into the fire risk for a Tesla Model S and have yet to release their findings. The NHTSA reaffirmed Tesla's 5-star safety rating late Monday. While the safety rating is important, it is based on crash tests -- not fires. The agency has not replied to a request for comment. Tesla declined to elaborate on its statement. Some traders on StockTwits, a social investing site, pointed out what they saw as misguided enthusiasm. "$TSLA goes up on a months-old safety rating that was 'reiterated,'" said BullHorns. "Every company should reiterate positive news daily. LOL." StockTwits user Fiftyfifty said that investors may be overreacting: "Knew people would confuse these ratings with the unrelated & ongoing investigation." Tesla, in its press release, said it is "worth noting that a Tesla vehicle is over five times less likely to experience a fire than the average gasoline car and that there have been zero serious injuries or deaths for any reason ever, fire or otherwise, in a Model S."